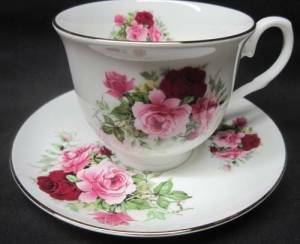 Pretty pink roses burst in full color on this pair of bone china cups and saucers trimmed in gold by York. Buds waiting to bloom among the greenery add to the vibrant shades of light to dark pink roses. These cups and saucers are not microwave oven safe.